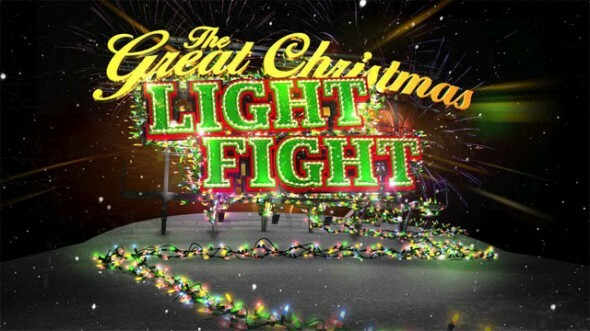 ABC has announced that season three of their The Great Christmas Light Fight competition series will debut on December 7th at 8pm. A pair of hour episodes will air on Monday nights for three weeks. This time around, Carter Oosterhouse and Taniya Nayak are replacing Michael Moloney and Sabrina Soto as the judges. It’s beginning to look a lot like Christmas with ABC’s hit holiday decorating competition series “The Great Christmas Light Fight,” premiering MONDAY, DECEMBER 7 (8:00-10:00 p.m., ET/PT). Produced by FremantleMedia North America, the immensely popular series returns for a third season with all new celebrity judges, Carter Oosterhouse (HGTV’s “Million Dollar Rooms”) and Taniya Nayak (Food Network’s “Restaurant Impossible”). “The Great Christmas Light Fight” features families and neighborhoods from across America decorating their homes to the extreme for Christmas with a total of $300,000 in prizes ($50,000 per episode) up for grabs. The series will air on MONDAYS, DECEMBER 7 (8:00-10:00 p.m., ET/PT), DECEMBER 14 (8:00-10:00 p.m., ET/PT) and DECEMBER 21 (8:00-10:00 p.m., ET/PT) with back-to-back episodes airing each night. At the helm of this fiercely festive competition are the judges: interior designer and star of the Food Network’s “Restaurant Impossible,” Taniya Nayak; and one of America’s most recognized lifestyle experts and host of HGTV’s “Million Dollar Rooms” Carter Oosterhouse. A native of India, Boston-based designer Taniya Nayak is known for designing many of New England’s hottest restaurants and lounges. As one of America’s premiere designers, she has made numerous appearances on national morning shows and home improvement programs. She is also a brand ambassador for ED On Air, Ellen DeGeneres’ home product line. “The Great Christmas Light Fight” comes from FremantleMedia North America (“American Idol,” “America’s Got Talent”). Brady Connell and Max Swedlow are Executive Producers for the series. Jennifer Mullin is the Executive Producer for FremantleMedia North America. FremantleMedia North America (FMNA) is the U.S. arm of global media giant FremantleMedia, which includes a distribution arm, FremantleMedia International, a digital and branded entertainment division and a kids & family entertainment business. As one of the world’s largest and most successful creators, producers and distributors of TV brands in the world, FremantleMedia’s comprehensive global network has operations in 28 countries, creating over 10,000 hours of programming a year, rolling out more than 45 formats and managing over 350 individual titles. The company also distributes more than 20,000 hours of content in over 200 territories. FMNA and its portfolio of companies, including Original Productions and 495 Productions, produce entertaining and innovative scripted and alternative programs for network, cable, syndicated and online platforms. Their slate includes a diverse range of both critically-acclaimed and award-winning successes including “American Idol” (FOX), “America’s Got Talent” (NBC), “Family Feud” (SYN), “Let’s Make A Deal” (CBS), “The Price Is Right” (CBS), “The Great Christmas Light Fight” (ABC), “Deadliest Catch” (Discovery), “Married to Medicine” (Bravo), “Party Down South” (CMT), “Ice Road Truckers” (HISTORY), “Storage Wars” (A&E), “Celebrity Family Feud” (ABC), “Celebrity Name Game” (SYN), “American Gods” (STARZ), among others. What do you think? Do you enjoy watching The Great Christmas Light Fight on ABC? Is it becoming an annual tradition in your home? What is the make model year of the red car Santa drives up in?